I've been using Google Voice for over a year to save about $1,000 on my mobile phone long distance calls from St. Paul to Montreal. I use Google's web tool on iPhone Safari.app to call a number; Google first calls my cell then it calls the remote number. It's been working very well, especially lately, even though Apple is a greedy coward for purging all GV apps from the iPhone and forcing me to use the inferior Google Web app. It's good stuff, but of course there are limitations. 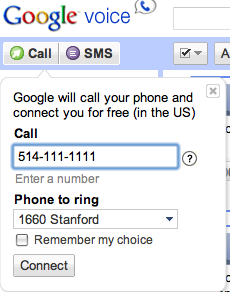 The first connection in the two connection Google Voice call must be within the US. So if I'm in Montreal, for example, I can't useGoogle Voice to call from Montreal to St. Paul. Except ... I slowly realized ... I can, from anywhere with a web browser, setup a call from one of my GV registered numbers to any other number on earth. It's not calling from Montreal to St Paul, it's telling Google to call St. Paul, then, when someone picks up, Google connects to Montreal. I can only create these connections to numbers that I've registered with Google (and that registration is all but exclusive, no more than two GV users can share a number), so practically speaking it's only useful for me setting up a phone call from my home to wherever I happen to be.